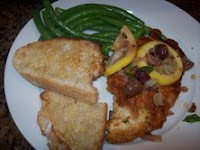 This is a little twist on Chicken Piccata... a great dish as I almost always have all the basic ingredients. The recipe is an adaptation from Ina Garten. Pound chicken breasts between within a freezer bag until thinned and evenly flattened. In a shallow dish, whisk together the mustard and eggs. Place bread crumbs in a wide, shallow bowl or pie plate. Dip the chicken breasts into the egg mixture then into the bread crumbs, coating well. Heat oil in a large skillet over medium heat. Cook the chicken until browned on both sides about 2 minutes on each side. Transfer chicken to a baking dish. Bake until cooked through - 4-5 minutes at 375. Pour excess fat from skillet; add chicken broth, lemon juice, capers (or olives) and salt. Bring to a boil, scraping browned bits from the bottom of skillet. Stir in chopped parsley. Spoon sauce over chicken, and serve immediately. Makes about 4 servings. I love chicken piccata. I find I really like savory foods with a bit of lemon. 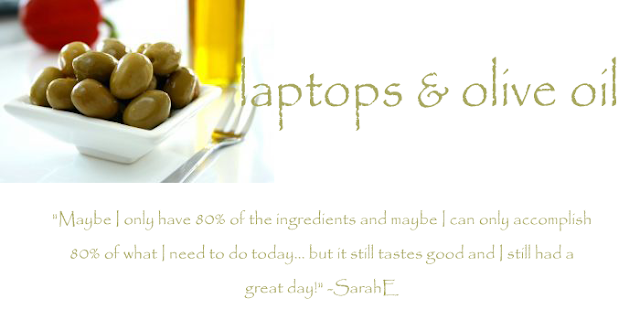 Or a lot of lemon, like Greek chicken-lemon soup. But my husband doesn't, so I don't usually prepare it, I just order it!